*Note* - An expanded version of this post can now be found here. For most businesses, the volume of incoming calls remains pretty steady or increases and decreases in a predictable way around known busy / quiet periods. Sometimes, however, a business can experience an unexpected surge in calls that can cause a few issues. Hopefully, when this happens to your business it’ll be for all the right reasons, such as a popular advertising campaign or a positive piece of PR in the media. The alternative is some negative publicity, or a major issue with your product / service, which isn’t at all pleasant to deal with. If you’re unfortunate enough to be stuck with an outdated phone system, you’re in for a bad time. All your phone lines will likely be blocked solid, leaving callers facing an engaged tone and your staff unable to dial out. If you’ve got a modern system you’re in a better position, with plenty of options of how you handle calls, as well as the flexibility to change things as you go along. First of all, put your calls into a queue so they can be answered in the order they are received. Determined callers can then wait until you are available, rather than constantly getting an engaged tone. Send your callers to an Answerphone service so they can leave a message if they want to. These messages are then emailed to your inbox and stored in your account so you can handle them in your own time. You can also offer your callers the option of leaving a message instead of waiting in a queue if you want. This can be a good way of easing the pressure short term, but obviously, you will need a strategy for responding to the messages if you want to keep your callers happy. Set up overflow Group Divert teams to step in and handle extra calls. The chances are you’ll already be distributing your calls to a team of people responsible for answering them. At times when call volumes are particularly high, you can set up your system so calls are diverted to other members of staff after a certain period waiting in the queue. This can help keep wait times down for your callers but can disrupt other members of staff if the volume of calls stays high for an extended period of time. Similar to above, you can also set up your system so calls are diverted to external resources when the volume is too high. This could be staff at another office, or it could be a team of virtual receptionists you keep available in case of such an eventuality. Of course, it could be a combination of both if you want – it’s completely up to you. Incidentally, if you are interested in having a team of virtual receptionists on standby please contact us as we can arrange this for you. One other thing we’d recommend is to set up a dedicated hotline number for specific purposes if you’re expecting a higher than usual call volume. This allows you to divert calls to people trained to answer them, whilst avoiding disruption to other members of staff. Adding an additional number is quick and easy to do through your Callagenix dashboard. 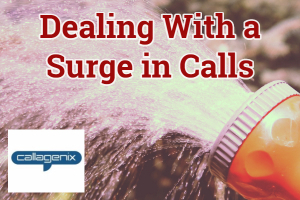 As you can see, there are plenty of options when it comes to handling a surge in call volume. How you respond is really down to you, and all the above can be combined in any way (along with other solutions we’ve not covered) to help you deal with the calls. Flexibility and speed of implementation are key when responding to rapid changes in call volume. Your choices will no doubt depend on whether the surge is expected or a complete surprise, and whether or not it’s likely to be a one-off or a regular occurrence. In any case, we’re happy to advise and help get things set up – just contact us to get started.